Was the northernmost camp along the Birkhead Mountain Trail really lost? Were we uncovering another mystery camp? On a recent hike in the Birkhead Mountains, I jokingly told someone "We're never lost - we're always right here." This camp might have been thinking the same thing as it watched us come and go for years, scratching our heads and wondering which camp it really was. Or maybe it didn't see us at all. Years ago the oak tree started growing a burl that bulged over and around the sign nailed to it. The tree was literally swallowing the sign. The upper part of the sign hasn't been visible for at least a decade. If one considers the hand-stamped camp number on the sign to be the camp's eyes, it has been playing the long version of peek-a-boo with us. For a number of years, hikers saw the wooden sign saying 'CAMP' on a post beside the Birkhead Mountain Trail and assumed the broad, flat area right beside the trail was the campsite. There were yellow blazes on trees leading down into the valley, but they were hard to spot. The first tree or two in the line may have even fallen, taking their blazes with them. I didn't see the side trail to the camp when I was mapping the trails for my guidebook in the mid-1990's. I labeled this Camp 1B, though I suspect I did so only because Bob Finley's little orange guidebook from 1991 called it that. At the time I was not aware of another sign, book, or map that labeled it Camp 1B. The 'B' part seemed really odd to me, but I dutifully followed Mr. Finley's lead. It wasn't until 2013 that I saw an old map hinting at the existence of a side trail to this camp. 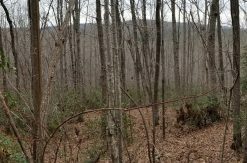 As I remeasured the trails for the second edition of the Uwharrie Lakes Region Trail Guide, I poked around further and found the faded yellow blazes leading down the hill. The cemented fire ring and already-obscured sign on the tree were waiting patiently in that high valley. I included the side trail and the camp in the second book. I called it Camp 1B again, with slightly more confidence. The label on the old hand-drawn map vaguely looked like a '1B', but could just as easily have been a '1' with a marked-out character beside it. At least now I had two different references to support the 'B' part. 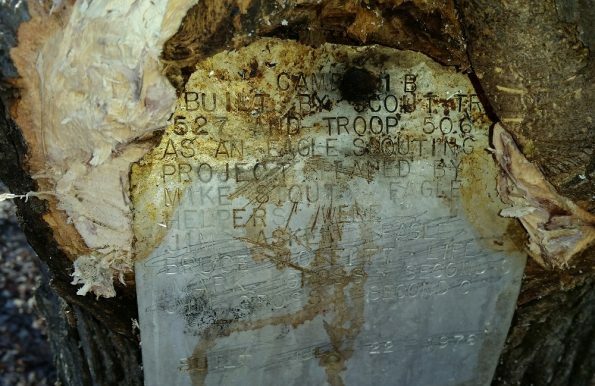 The rediscovery of the camp at the Tadlock homestead raised a good question. Camps 3, 4, 5, and 6 are well-known spots in the Birkhead Mountains Wilderness. Logically, we want there to be a Camp 1 and 2 also. Were these two locations Camp 1 and Camp 2? If so, which camp is which? With one sign not being numbered and the other sign not being fully visible, the camp signs themselves weren't able to provide a definite answer. 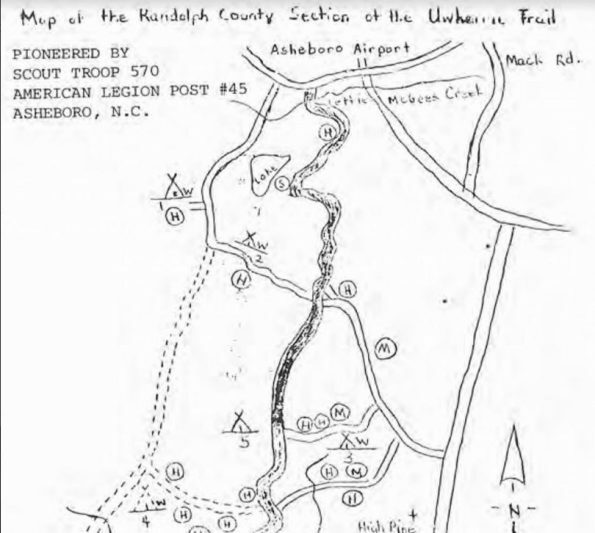 These two camps appear on at least two old maps of the Uwharrie Trail. The old map I saw in 2013 was given to David Gardener, one of the Uwharrie TrailBlazers, by Joe Moffitt himself. This map is not dated but appears to be from the 1970's. 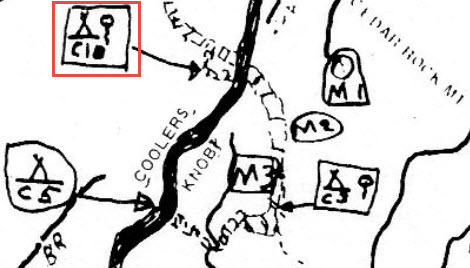 This map labels what appears to be the Tadlock camp as 'C2' and the high camp as 'C1B' (or 'C1' & a squiggly mark). 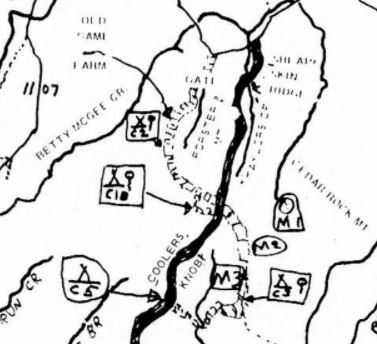 In Joe Moffitt's book An Afternoon Hike Into The Past, published in 1975, the map on page 144 labels what appears to be the Tadlock camp as Camp 1. There is another camp shown between there and the Birkhead Mountain Trail labeled Camp 2. This second camp is drawn on the north side of the old road that climbs up the mountain and is shown much further west than one would expect for the high valley camp. But interpreting relative scale from hand-drawn maps is tricky business. After the page 144 map was posted in the Uwharrie TrailBlazers Facebook group in December 2017, Joey Moffitt recognized it as one he drew for his Eagle project. He noted that it was the first one made. These two maps from two Moffitt's appear to label these two camps oppositely. Or maybe we're just not reading the information on these hand-drawn maps the right way. What we know about the other camps tells us the numbering sequence was not simply based on location or when the camps were built. Over the years, more than one hiker has quietly dropped off the ridge into that high, remote valley and worked in solitude to cut back the burl. It's the kind of place where you feel the trees and rocks and perhaps a few spirits watching you from the surrounding ridgelines. They look over your shoulder and breathe down the back of your neck. Most certainly you are being judged - but favorably, or not? These attempts all failed. Last November, I was dismayed to see my previous attempt from several years prior apparently had no lasting impact. The bulging burl obscured even more lines of text on the sign. After the Uwharrie TrailBlazers' members-only hike in January 2018, I spoke with Les Caison in the parking lot and mentioned the possibility of going back up to work on the burl. He was game, despite the cold weather and having already done a decent hike that day. I had thrown some tools in the car just in case I had the chance to do this. I have a 90-minute drive to get to the Birkheads, so it makes sense to do as much as I can when I visit. Without the willing agreement from Les as motivation, I probably would have just turned on the heated seats and enjoyed my drive home. As we hiked back to the high camp, I learned Les had also been one of those people watched by the trees as he worked unsuccessfully to remove the burl. Having company this time gave us courage! The height of the sign on the tree made working on the burl a challenge. I'm over six feet tall, but the burl over the sign is still at the upper limit of my reach. You can't get much leverage standing on tiptoes and reaching that high. Blood quickly drains out of my arms when raised overhead. A step ladder would have been nice, but would be too heavy to haul in. David Craft had suggested standing on a five-gallon bucket. 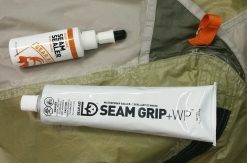 My ultralight solution consisted of two pieces of 2x4 and a long strap. Les and I nailed one board on each side of the tree. Standing on those boards, we put the strap around the tree and our waist and leaned back like a lineman working on a power pole. This put the burl at about chest level. We tried sawing away the bulk of the burl. Our working angle was still a little awkward for sawing. We then tried using a hammer and chisel to chip away smaller pieces. That worked better, though we had to be careful not to slip and damage the soft aluminum sign we were trying to uncover. Previous attempts had killed part of the burl. This dead wood covered most of the top of the sign. New burl growth had then grown around this dead wood and was swallowing it too. By carefully chipping away at the dead wood in the middle, we were able to make slow but steady progress. As wood chunks fell away, more lines of text were revealed. We took turns working on the tree. I learned Les actually had some formal education in studio arts and with sculpture in particular. Perfect! After one of my turns, Les politely commented that my chiseling work looked 'exquisite'. I knew then to just get out of the way and let a pro handle this job. After nearly an hour of cautious sawing and chiseling, Les pried away a chunk of wood and could see the top edge of the sign. Years of crud from being in the belly of the tree coated the sign. Some spit and elbow grease wiped that away and revealed the top line of text: Camp 1 B! I was excited we had finally uncovered the sign, and a little disappointed to learn it wasn't simply Camp 1 or Camp 2. By now I should know that Uwharrie likes to hang on to its mysteries and only reveal a few secrets at a time. If this is Camp 1B, is there a Camp 1 somewhere? Is the Tadlock homestead Camp 2 or could it be Camp 1? If Tadlock is Camp 1, where is Camp 2? After the second edition of my trail guide was published in 2014, I finally saw pages from the little green guidebook that Nicholas Hancock published in 1983. He referred to the high camp as the Joe Moffitt Camp and labeled it Camp 1B. Just like Bob Finley's little orange guidebook from 1991. And the hand-drawn map from Joe Moffitt circa 1970's. 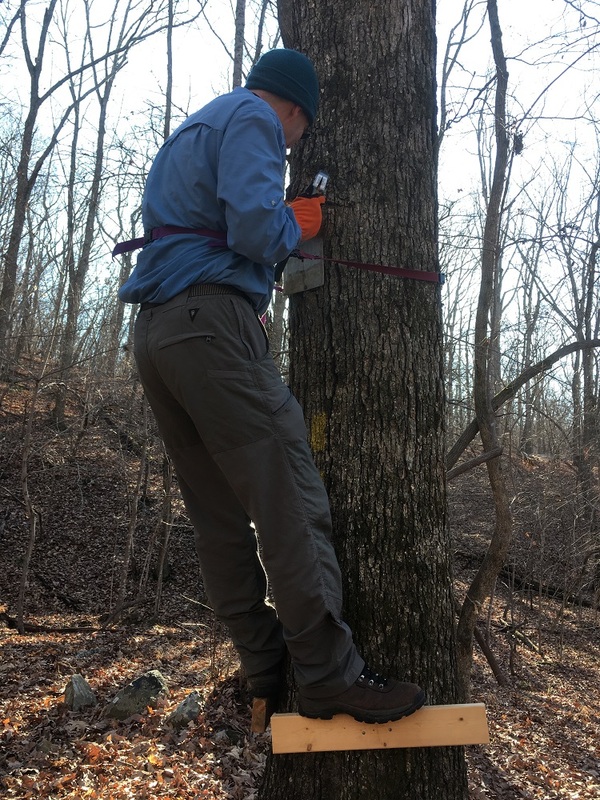 The hand-punched aluminum sign on the tree in the high valley finally clinched it for me. I am 100% sure this is Camp 1B. Maybe Camp 1B wasn't lost all this time. Maybe I just lost track of it on paper and lost a little faith while playing peek-a-boo.